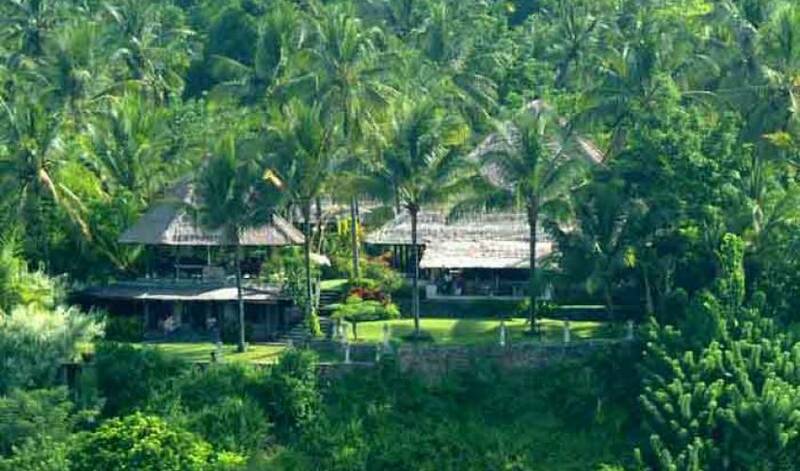 Resting on a magnificent bluff above the Ayung river rapids in central Bali, a secluded and romantic villa overlooks panoramic vistas unsurpassed on the paradise island. Grandeur is what this 5 bedroom villa is all about right from its spectacular location through lavish appointments, comprehensive facilities, lush landscape and solid infrastructure. 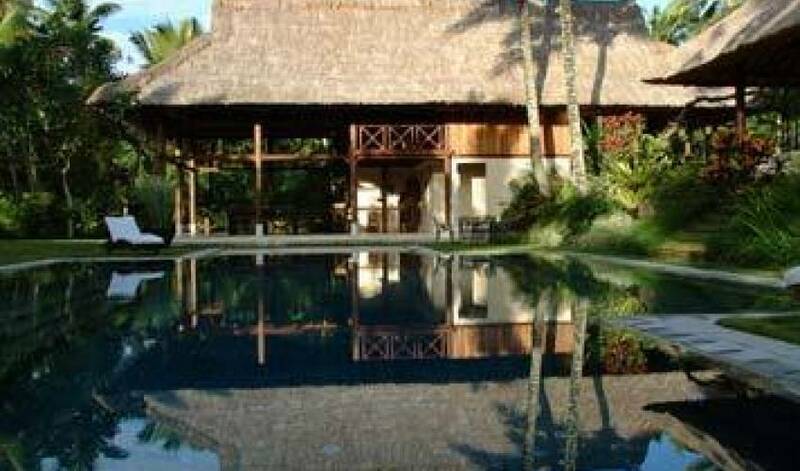 For the large family, group of friends or corporate team this residence affords a self contained stay at a level of luxury well beyond the most lavish resort. Typically those seeking tranquility and a fuller exposure to Bali's fascinating culture have opted to stay in the island's artistic heartland of Ubud. The villa lies in these foothills amidst a rural village that observes the society's highly theatrical cultural rituals in daily life. The movie theatre room can be converted into a 6th bedroom if needed. At the heart of the one-hectare estate stands a walled main villa complex external to which are a tennis court, cottage and utility structures. 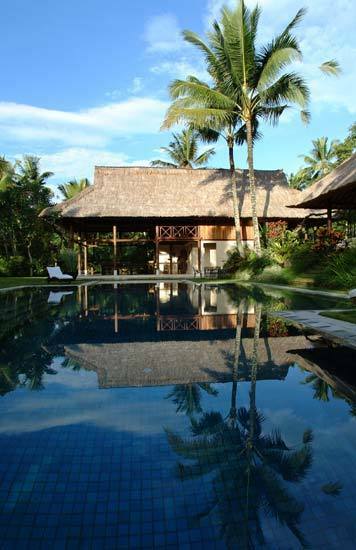 The Villa comprises alang alang (thatch) roofed bales (buildings) set on elevations surrounding the swimming pool and aligned in accord with Balinese cosmology. Two, connected by covered sandstone walkways, contain four bedrooms and living areas while another houses dining, billiard room and kitchen. Smaller bales with living and sitting rooms lie on the southern and eastern sides of the villa.Subtle landscaping masks the guest suite and disco / movie theatre, built under the two smaller bales and facing away from the main complex. An orientation giving seclusion for the guest and isolation of villa serenity from noisy entertainment. Approaching the estate a paved driveway leaves the public road and runs 50 meters eastward under a canopy of fruit trees and bamboo to emerge at the cottage atop a hill. The drive's winding descent beyond the garage crosses a bridged jungle stream and proceeds upward and eastward to the tennis court and bordering spectator bar bale. Astroturfed for a superior playing surface, the court has floodlighting as nighttime is the favorite time for play. East of the tennis court an imposing gateway opens to a large entry courtyard functioning as the villa vestibule. Tropical gardens, a fountain and the ruins of a mud wall farmhouse feature prominently. Sandstone paths lead off through thatched gates to the main house, kitchen, staff area and vegetable gardens. Continuing through another courtyard the main house pathway crosses a large pond to reach the terrazzo and sandstone foyer. Stairs lead up to the central dining room with its ten-seater table and period paintings. This room overlooks the swimming pool and billiard room, which is located in the same building. A massive 12 foot x 6 foot Italian slate and mahogany snooker table dominates, standing on a polished hardwood floor. Also sharing this building and situated underneath the dining room is a comprehensively equipped commercial kitchen with access from the main house and entry courtyard. This facility can serve groups much bigger than the full complement of villa residents and is designed to cater to large events such as wedding and corporate group functions. A staff area and restroom are located in the kitchen courtyard. Across the pool from the main dining room, an octagonal bale rests on a rise at the east end of the property. This room seemingly floats over an immense amphitheatre-like sandstone gorge framed by lush jungle and with panoramic views of a horseshoe bend in the fast flowing river. For whiling away the hours Dutch colonial style easy chairs accompany a seductive antique day bed. Enchanting lunches are taken at the tatami dining area but tend to linger as the prevailing breezes amplify the appeal of the view. A guest suite nestles beneath the east bale sharing its wonderful views. Secluded from the main villa this unit is enclosed by a shingle-roofed terrace with dining, lounge and spa massage areas. A small servery and bar give a nice degree of self containment. Octagonal also, the bedroom centers on a king size canopied bed which faces the valley and morning sun. 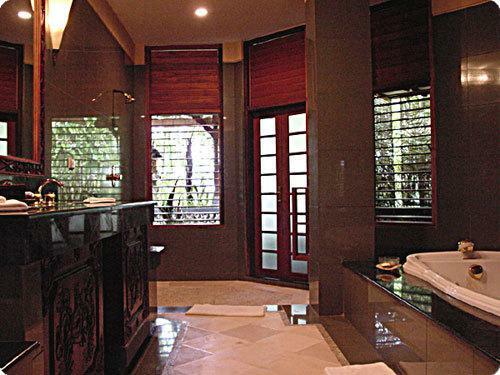 An ensuite behind the bedroom, surfaced with polished African granite (green marble) and sandstone, has shower, double bowl vanity and a Jacuzzi tub. At night the river sound is everywhere in this suite giving a sense of complete detachment from the outside world. Soaring thatched rooflines form an enduring image of the villa and two of the largest, housing four bedrooms, rise above the pool on its northern side. Tucked deep within the larger 'Main Bale', the master bedroom from its private deck overlooks colorful gardens that hover over the river view. A four-poster king size bed sits under a billowing mosquito net surrounded by Persian rugs on a gleaming dark hardwood floor. Oil paintings of an earlier period adorn creamy plastered walls. Through opened glass paneled doors and wooden shutters the sound of the rushing river fills the room. Sumptuous, the Ensuite, as large as the bedroom itself, is floored and surfaced in a mixture of contrasting green African granite and white sandstone with brass inlays and faucetry. Hefty opening windows border a large Jacuzzi sitting just inside the roofline, within a marble platform. The impression is of bathing in the garden. A polished granite double basin vanity fills one side while a massage table and capacious hardwood wardrobe complete the furnishing. Outdoors, a shower sits in the small attached garden. Remaining bedrooms are of the same or similar size, furnishings and finish to the master bedroom. 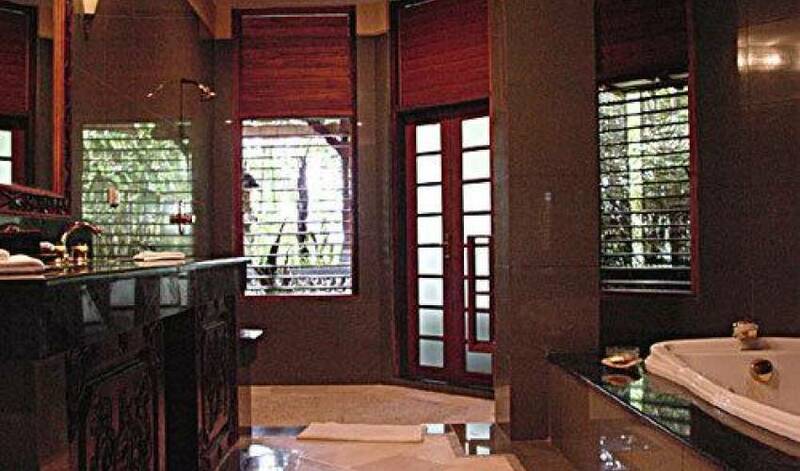 Likewise the Ensuites but with beguiling contrasts such as two with Jacuzzis rather than showers in garden bales. These bedrooms all look out through wooden shutters onto cascading fountain ponds and have views over the pool. Walled private gardens are large and ample for lounging, massage or spa health and beauty sessions. 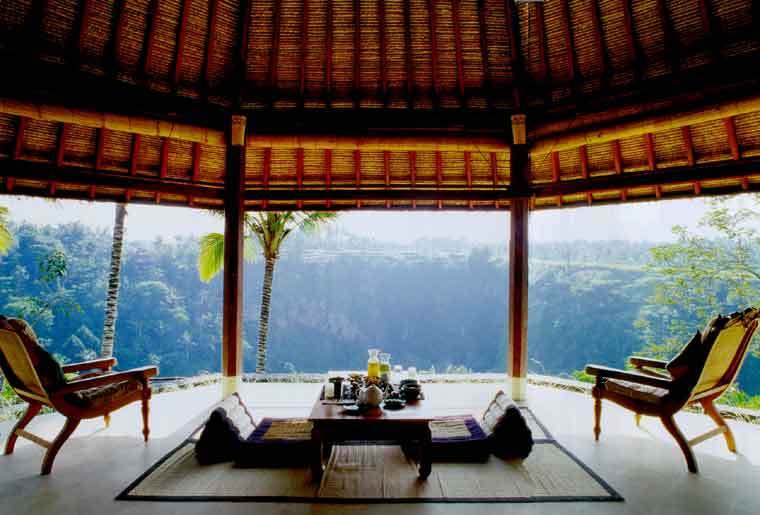 Central in the Main Bale overlooking the eastern valley gorge are the main living room and veranda. Furnished for reclining with floors of cool terrazzo and soft palimanan, this is the area to lounge, read, converse or just watch the river roll by. Snuggled deep within the bale, a teak setting hosts the more intimate dining occasions. Oriental simplicity and serenity underscore the Meditation Bale located to the south. Plump floor cushions form seating around a substantial but simple low table, a change of which frequently sees this room used for Korean Kalbi barbecues. It is actually superbly positioned for dining at any time. From south come cooling daytime breezes and a downstream view. Night times see a change of character as cooler mountain breezes descend. The south bale stands silhouetted against the night sky, a natural stage for Gamelan, Legong, Wayang shadow puppet and dance performances of local artistes. 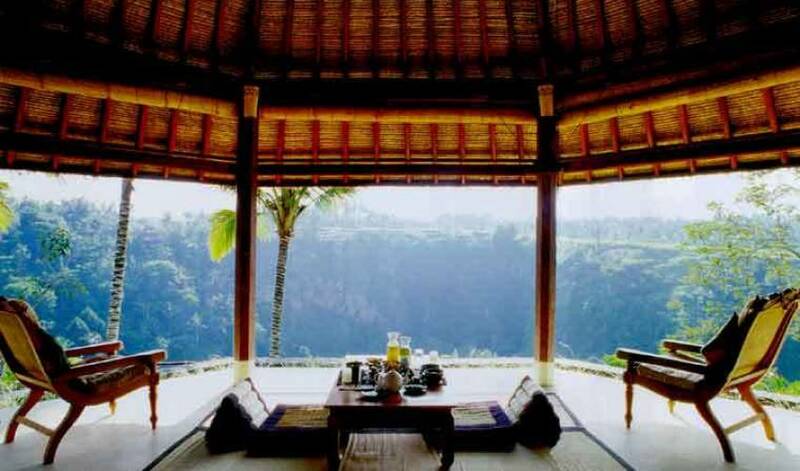 Southeast, centered on a waterfall, the Pita Maha private Villas Spa enhances the valley with its Bali village style and protect views of the picturesque gorge and rice fields from further development. 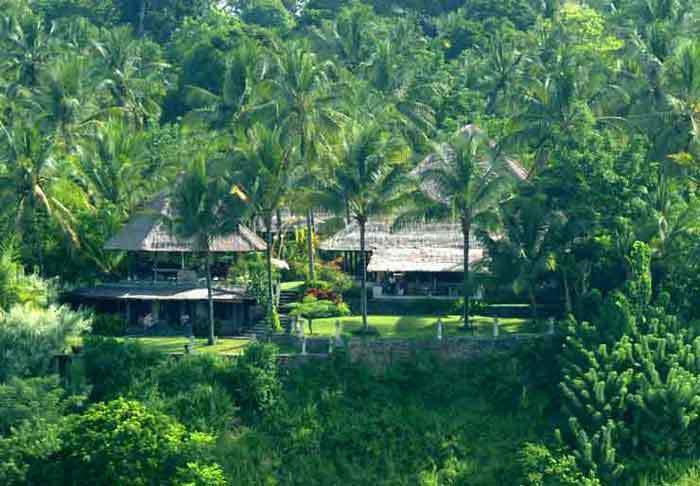 The owners, Ubud' royal family, famous patrons of the arts, commissioned a new Gamelan orchestra for the spa. Regular recitals magically complement the valley atmosphere. Beneath the south bale and sited for maximum soundproofing is a private entertainment center. Equipment is 'high end' including a 128 x 72 inch projection system, comprehensive AV sound equipment and separate audiophile system for discerning music lovers. Bali's equatorial location has enabled connection of the satellite receiver to all eastern hemisphere satellites giving an extensive array of TV programming in a multitude of languages. An extensive movie and music library together with computers, Playstation and a selection of book titles complete the room. Custom-built elevated couches demount for reconfiguration as a conference room or disco. Cool dry season evenings in July and August lower water temperatures to a quite cold level that persists throughout the balmy days. While bracing for an exercise swim the water is chilly for those who want to play or just laze. The tiled pool at the villa is climate controlled to counter this effect and dramatically increase its usability, for Bali a unique but very sensible feature. Cross-shaped, with swim out lounge and play areas on either side of the width, it's 20 meter unobstructed length is an excellent lap pool. 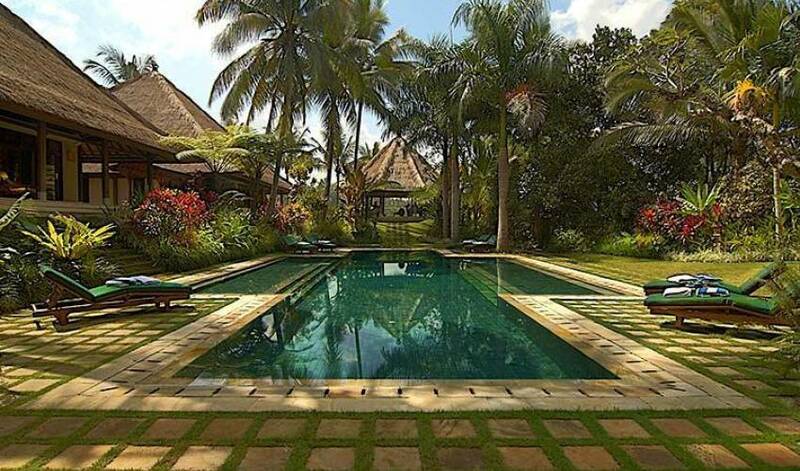 Surrounding stone and grass terraces with sun loungers provide for classical lazing by a tropical pool. For those so inclined, a stone chess table with wrought iron chairs is close by. 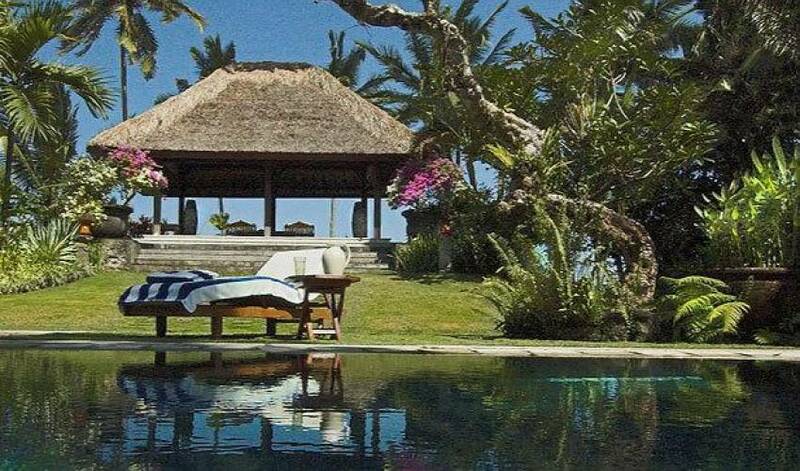 Tropical Spa health and beauty centers are a major attraction of South East Asia and The villa provides a personal Spa for guests in the privacy of their own suites. The mood, opulence and tropical gardens of the Ensuites coalesce with the villas tranquility and seclusion to form an environment intimately harmonized to the spa experience. For a more holistic approach, special spa oriented meals are available from the kitchen as well as custom Jammu and fresh local fruit drinks. Professional therapists and masseurs using the Martha Tillar range of products render spa treatments. 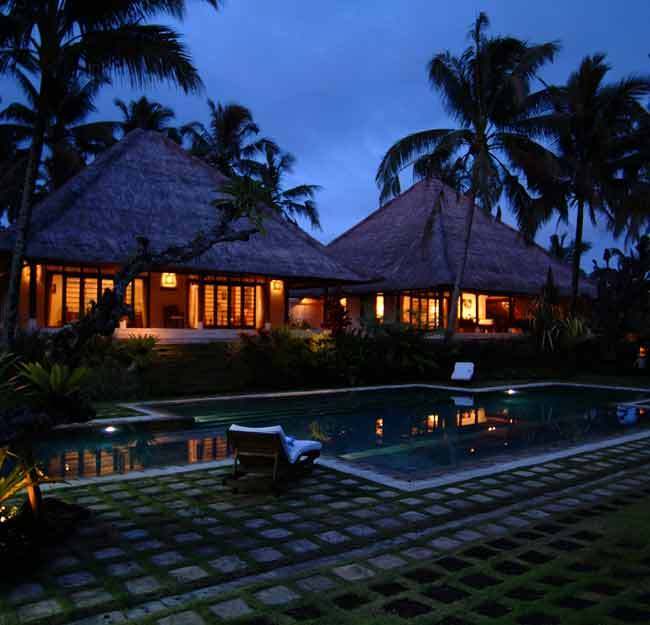 Parties of 10 adults are comfortably accommodated in the villa's five bedrooms. Expansion to 15 or 20 is possible with fold up beds for children. 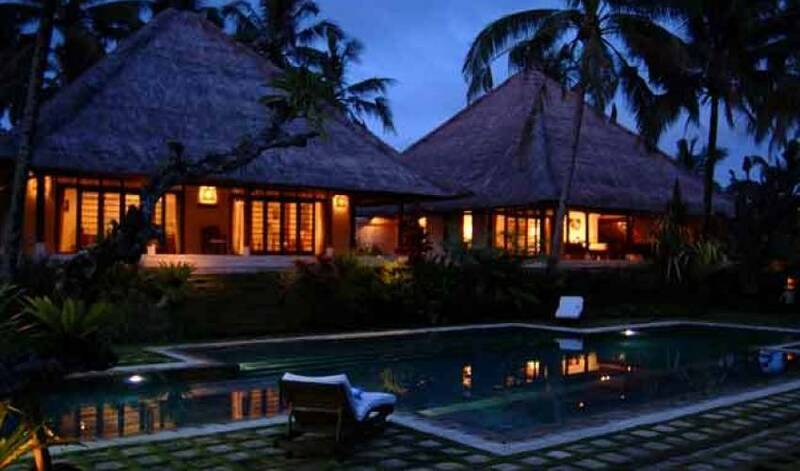 For still larger parties the charming guest cottage set in jungle near the entry is also available. Amenities include two bedrooms with Ensuites, a living room and kitchenette. The walled garden's dining terrace borders a lotus pond in the corner of which is a spa pool. Rooms in the cottage are smaller but furnished to the same level as the main villa. 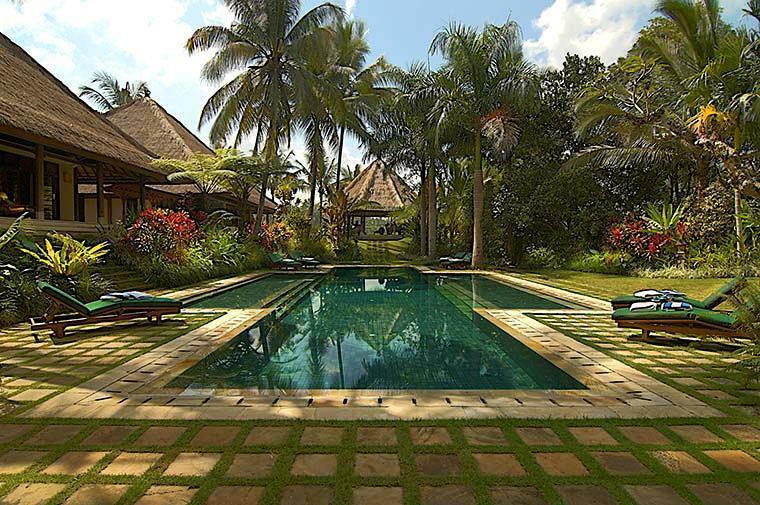 The villa boasts superior first world infrastructure in a rural Balinese setting. Water flowing underground from nearby mountains is pumped from a 120 meter deep well guaranteeing availability and purity; it is reticulated through pressure systems that can simultaneously fill all Jacuzzis within 15 minutes. Likewise the hot water systems can fill all five tubs three times an hour. Industrial level power generation automatically takes over from a dedicated 3 phase mains feed on power failure and can operate uninterrupted for one week without refueling. A biological sewerage treatment plant produces clean odor free irrigation water and the list goes on. In a similar vein this property was developed as an elite rental villa and seeks to cater to a wide range of personal tastes without compromising the ambiance that makes it special. The nights are so cool that you'll never use them but oversized air conditioners are in all bedrooms anyway. Beds are deluxe teak four posters fitted with top of the line Royal Jewel Slumberland mattresses, three levels above those found in luxury boutique hotels. The entertainment center, located to preserve the tranquility of the villa and its neighborhood, is equipped for the sometimes noisy fun of the young and young at heart, as well as super large screen CNN, football, Playstation et al. A PABX links all bedrooms, Ensuite and facilities with each other and two telephone lines. Main 20 meter x 6.5 meter (average) Salt water, heated if required. PABX Phone sets in all bedrooms, bathrooms & facilities. 24 internal, 2 external lines. 3 cooks, 5 house maids, 4 gardeners, 3 security, resident Maintenance engineer.